Animas Corporation, which is now a Johnson & Johnson company, purchased the intellectual property and all of the assets of the original manufacturer of the GlucoWatch G2 Biographer, Cygnus Inc. in Redwood City, California. Animas Corporation is no longer selling the current model GlucoWatch G2 Biographer system. Animas continues to sell AutoSensors and provides customer support for the GlucoWatch system through July 31, 2008. Sales of the first glucose meter that tests through the skin and automatically provides continuous readings finally began in the United States in 2002. The manufacturer, Cygnus Inc. of Redwood City, California, had been seeking FDA approval since June 1999. 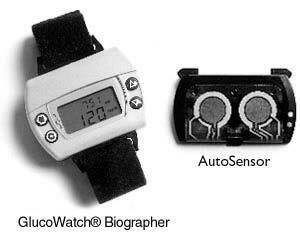 The current version, named the GlucoWatch G2 Biographer, provides readings every 10 minutes. You can wear the GlucoWatch like a wristwatch. It uses a low electric current to pull glucose through the skin, so it is minimally invasive. You will be able to program a built-in alarm to alert you when your glucose level is dangerously low or high. The GlucoWatch is a major advance in glucose testing. But it doesn't totally replace conventional meters and is not yet the Holy Grail. Cygnus is already working on second and third generation products that will overcome some of its limitations. Some people experience skin irritation. The company says it tends to disappear in a few days, but the FDA says that it affects half of all users. There doesn't seem to be a way to tell in advance who will be affected, some people who have actually tested the device tell me. You will need to warm up the GlucoWatch for two hours and calibrate or set it by using a finger-stick measurement. Compared with finger-stick readings it has a 15-minute lag time. Physicians must prescribe it after both the physician and the user complete formal training. In clinical studies GlucoWatch measurements were usually consistent with traditional finger-prick tests, but results different by 30 percent or more one-fourth of the time, especially at low glucose levels. At least half of the users experienced mild to moderate skin irritation, the FDA says. The company site says that it "shuts off early about 25% of the time." It has "certain problems (for example, dislodging the GlucoWatch from your skin) can cause the system to shut off glucose monitoring completely." The watch can skip readings when "Bumping the Biographer suddenly...[with] rapid temperature changes (for example, going into an air-conditioned building after being outside on a hot day)...excessive perspiration." In addition, "It may take more than one try to calibrate the Biographer. This will require doing additional finger-stick tests. In home-use studies, the calibration step had to be redone about 20% of the time (1 out of 5). Occasionally, the Biographer will not calibrate at all." Keep in mind that the watch requires a three-hour warm-up period before you can even attempt to calibrate the watch. The company says that in the U.S. the price of the starter kit, which includes the GlucoWatch Biographer, instructional video, user guide, battery charger and two rechargeable batteries, as well as other accessories, is $698. AutoSensors are sold in cartons of 16 and sell for $120, which works out to $7.50 each. They are good for 13 hours each. Also available at $60.00 is the GlucoWatch Analyzer, which is a program that downloads into a personal computer and is designed to display and store data retrieved by the individual's GlucoWatch. The sensors alone will cost $5,055 for one year's coverage (24 hours/day times 365 days/year divided by 13 hours/sensor equals 674 times $7.50 each). This means that the initial year's cost for the GlucoWatch itself and sensors will be $5,753. That's considerably more than test strips, which probably average about $0.75 each. So even if you test eight times a day, the strips would cost only $2,190 annually. Cygnus says that it doesn't know yet whether insurance plans will cover the GlucoWatch and its AutoSensors. The FDA initially approved the GlucoWatch for adults only. In August 2002 it approved its use by children ages 7 to 17. For these frequent testers the GlucoWatch could be a lifesaver. Because it is much more convenient than traditional meters and is for some people is pain-free, people will be able to test even more often. That can translate into much tighter control and therefore fewer complications. The company's "initial target audience" is the 20 percent of those people diagnosed with diabetes who are, according to Roper Starch data, "frequent testers and frequent insulin injectors," Craig Carlson, the company's chief financial officer told investment analysts in a conference call the day the FDA approved the GlucoWatch. The worldwide glucose monitoring market is $3.5 billion annually, of which 60 percent is in the United States, he says. The initial target audience represents more than half of U.S. sales, so "they are indeed the heavy user group." The United States has 10 million people diagnosed with diabetes, Carlson says. That's the official number—10.3 million to be more precise—but these are old numbers. Scientists from two divisions of the U.S. government's Centers for Disease Control and Prevention in Atlanta recently collaborated on an article entitled "Diabetes Trends in the U.S.: 1990-1998." This article, published in Diabetes Care 2000 Sept;23(9):1278-1283, found that the prevalence of diagnosed diabetes increased by 33 percent nationally during this time, reaching 6.5 percent of those over 18 in 1998. CDC scientists updated this information in a letter to the editor entitled, "The Continuing Increase of Diabetes in the U.S.,"; which was published in Diabetes Care 2001 Feb;24(2):412. This letter reported that the prevalence of diabetes increased to 6.9 percent of Americans over 18 in 1999. Neither report says how many people that is. But U.S. Census Bureau data say the country's population was 272,690,813 in 1999, of which 74.3 percent, or 202,609,270, were over 18. If 6.9 percent have diagnosed diabetes, the number is 13.98 million—a considerable increase over the official 10.3 million figure. This does not include Americans under 18. According to the Juvenile Diabetes Foundation International there are approximately 127,000 children younger than 19 who have diabetes, almost all of whom have type 1. That would bring the total of Americans with diagnosed diabetes to 14.1 million. Carlson won't say how much of the company's target audience—the 20 percent who are frequent testers—that Cygnus expects to capture. "But if you pick 10 percent of it, that's 200,000 people," he says. Actually, with the new CDC data that's more like 282,000 people.